Explore the historically rich Iziko South African Museum in its prime with the aid of Iziko South African Museum tickets. Iziko South African Museum ticket prices provided under the tickets section includes a well-informed tour guide and various other exclusive experiences that are not covered in the general tickets for Iziko South African Museum. Buy tickets for Iziko South African Museum from here and get the best out of the museum for Iziko South African Museum prices are at an all-time low. 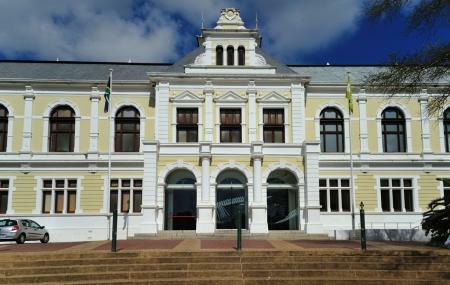 Also known as the South African National Museum, Iziko South African Museum and planetarium the first museum in the country and was established in the late 19th century. With informative exhibits and displays dedicated to diverse fields of zoology, paleontology and archaeology, this museum is spread over four elaborate floors. The permanent and temporary displays include a variety of collections from fossils to rock art. The exhibits are informative and make it a must-visit on a trip to Cape Town. Also, visit the popular attractions in the city by following Cape Town itinerary 2 days. Special learning sessions for students are conducted by the museum. Look into the timings section for Iziko South African Museum opening hours. For Iziko South African Museum parking details contact the management. Iziko South African Museum entrance fees are priced at 30 ZAR. Students and children have reduced tickets. Family and group tickets are available. Iziko South African Museum wildlife photography may cost extra. How popular is Iziko South African Museum? People normally club together Kirstenbosch National Botanical Gardens and Two Oceans Aquarium while planning their visit to Iziko South African Museum. The museum is amazing. Awesome displays and great information was available. The planetarium is a must to do with the children. Nice museum. Lot of natural species and and and history present. Best for small children. Some astrological and minerals are present. A must visit place. For adults it is general place not very much to enjoy. The Museum has fantastic displays...but the human history ha been changed rapidly and now is not worth the visit...what was the problem? I cannot ssy...but I think the museum is not whay it used to be.. I enjoyed my last visit there because of the new dinosaur exhibit. My children enjoyed it. I feel like they should do more to attract people though, there's still a lot of old stuffed animals that have been there since I was at school.